The other day, I was told by someone who I just met that I was rounded. I had a round energy about me. There is certain roundness about me, she explained. I stopped to think about it for a moment. It couldn’t be that I had a round face, or that I had a round body… Or it couldn’t have meant that I was well-rounded because we just met for the first time. I didn’t even talk much to reveal I was skilled at more than one thing. I thought for a moment. “It must be the Tai Chi,” I said. I smiled and told her that I carry this bubble of protection around me as an introvert. It keeps me shielded and keeps those at bay from getting in. And I guess this person noticed it. When I think about this bubble of protection, I look to the Ward Off posture in the Tai chi form. Ward Off means to protect or prevent someone or something from getting inside. It means not inviting something in. The shape that Ward Off takes is that of a canopy or umbrella. Your arms are rounded as if you are creating a shield around you. The energy behind that shape is what the Chinese call Peng energy. The word Peng in Chinese means canopy. When rain drops fall on the canopy, it does not penetrate the canopy, but rather bounces off because of its shape. Peng energy is what you use to make your shapes in Tai Chi. Peng energy is a combination of loosening and stretching your body while making the shape you want without straightening out your joints. When you practice Tai Chi, you use it all the time. Peng is an outward expression of your energy. There is an expansive quality to your movements when you use peng energy. Peng energy is supportive of the shapes you make. Yet Peng requires internal strength. So it is not an outward show of muscle when you display your peng energy. That would give your opponent something to grab onto in physical contact. You cannot make peng energy by flexing your muscles. You need something more than external power to make peng energy. It is this internal strength that makes you rounded. Your opponent would find it very difficult to hold on to you because there is no outward display of muscle. Your muscles make you stiff. When you are stiff, you attract things that attach to that stiffness. This is especially the case when you are stiff in your hips and your shoulders. So you loosen up your body to give you balance. You stretch your body so peng energy remains connected. But your limbs and body should not be overextended as to become rigid. That is where peng energy is lost… when the joints are straightened out. Always work on your peng, and become rounded. Work on releasing the tension in your shoulders. If you understand peng, then you can see clearly that it is present. And this person I met recently saw the peng energy in me. Peng is not something you can just turn on and off. It is an energy that you constantly work on having all the time. You continue to improve its quality in your practice. Peng energy can be improved upon by touch. In the physical practice of Tai Chi, peng energy can be demonstrated when I lean and put my weight on a student in their Ward Off position. I tell the student to not let me in, and to not push me away. I tell the student to take me to the ground. This is not logical and very counter-intuitive for the student. When the student takes my weight and pressure into the ground, the body and mind are connected in such a way that this happens with little effort. The student’s body is loose and I metaphysically fall into the ground. If the student’s body is stiff and not flexible, then I would have physically pushed the student over. It works in the non-physical realm too. This quality of being rounded prevents negative energies from clinging to you. When you are rounded there is no amount of surface for negativity to sit on. Negativity just falls off from you. You are not affected by negativity or other invisible energies that may cause you stress. And you’re attached to them. Rather, put your mind into singular roundness. Start by loosening the body, then stretch your joints and limbs. Peng energy is slowly formed in the shapes you make. In your Tai Chi practice, start and end each posture with peng energy. Then use it continuously in the process of motion. Make all of your movements flow in a fluid manner. They are soft and round. Before you know it, you’ll have completed the circle and have a nice bubble around you to ward off any evil that might be coming your way. Get Irving's New Guidebook FREE when you sign up for The Art of Tai Chi newsletter below! Now please check your email for an important message from me. 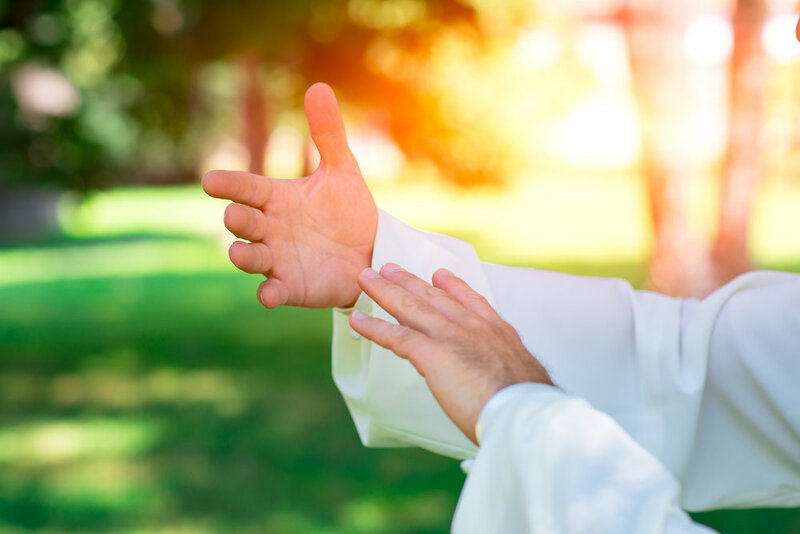 Welcome to The Art of Tai Chi community! Sign up with your email address to receive information on how The Art of Tai Chi will quickly, positively, and permanently change your life. © 2018 Art of Tai Chi. All Rights Reserved.